I knew these where a hit when my husband took his first bite and said " Oh Man These Are Good"..he usually doesn't say much...just eats! The recipe is from the front page of http://northwestsourdough.com/ . I used my left over Rye Starter with GM organic AP Flour and the barley malt syrup instead of sugar and water, melted butter, with powder milk directions. I also freeze any leftover fully cooked waffles so the midnite snacker can have his toaster waffles! This is a very rare breakfast treat for us! Any of you Oldies recognize the "Plate"? Sylvia - we are on the same wavelength as I just made SD waffles also this past weekend. There is nothing better than good sourdough waffles, crispy on the outside, light as a cloud on the inside. Funny you mention using a rye starter for these, I just noted on another post how I once used my rye starter rather than my usual wheat starter in the sourdough waffles I always make from the King Arthur Baking Companion book. My rye starter was extremely sour, and the waffles had a really off taste when combined with maple syrup. Perhaps your rye starter isn't that strongly sour? Thank you mountaindog! Your waffles look lovely and tastey! My husband loves waffles. I love them with fresh fruit! My rye starter has a very light pleasant sent to it and not very sour...I was making my starters way to sour and have just recently started enjoying them with a much less sour taste. Next time I make waffle's Im going to try the KA recipe...It has fewer ingredients and the formula is less work and I love anything with buttermilk in it...so Im sure we will enjoy them very much...I would say by looking at your photo yours are lighter and crispier than the formula I used....did you use a combination of flours? I can't remember how long I've had this waffle iron...it's small and just right for 2 people and very easy to clean. Gosh, I was contemplating how good sourdough pancakes would taste for dinner. Wish I had thought about that last night so I could have started the mix. 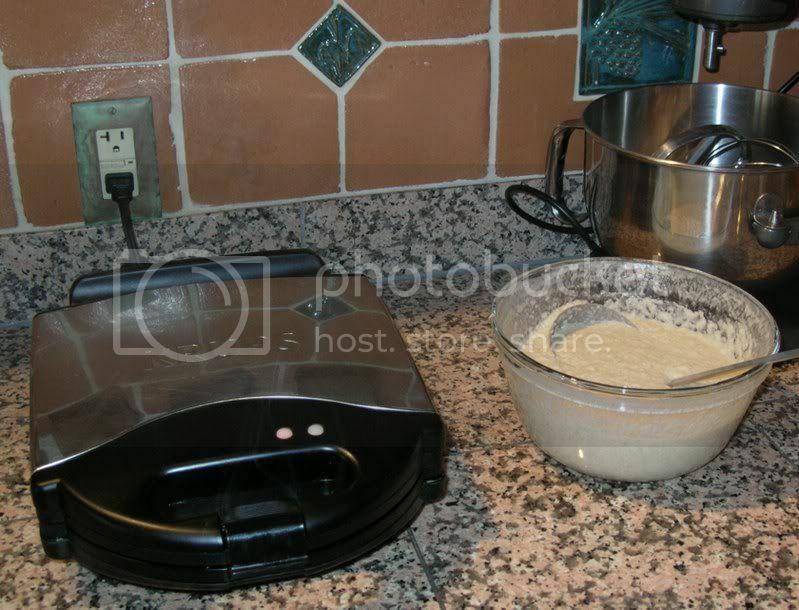 Your and mountaindog's waffles look so yummy, it makes me contemplate buying a waffle iron. Has the technology improved? 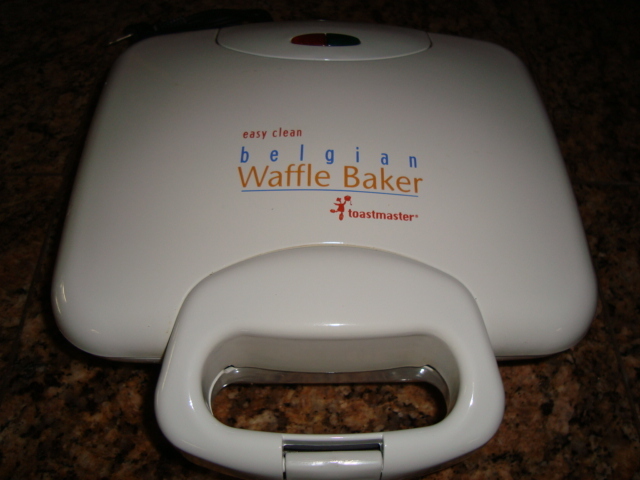 My mother used to have one but it was an immense pain to clean because bits of cooked waffle stuck. I find the Belgian waffle iron easier to keep clean because of the large spacing, the Krups has a nice handle that you don't burn your hand on when opening the iron as well. Cooks pretty fast too. I end up using mine quite frequently, more than I thought I would, esp. when we have overnight visitors...and mostly because the SD waffles are THAT good! And Sylvia, you set a beautiful breakfast table, better than any B&B! What kind of plate is that? Mountaindog... thank you, Do you remember all the Jaditeware!! You see it Martha Stewarts cupboards... I have a bit of a collection! This plate is part of a set called 'Shell' pattern. Also I forgot to tell you it was a real toss up to make your cherry pecan pain au levain..! !choose the easy one...waffles...but it is on my to do list. I have the flu coming on and Im just not all here today!! a waffle iron ! The sourdough waffles are light, almost ethereal..can you believe? I have a Waring rotating iron, that I love. Makes cooking waffles a breeze with an automatic timer and cleans up just as easily. This is a huge family favorite, especially with fresh fruit in the summer. Thank you and also for the site correction...I seem to always mess that up!! Waffles are great anytime...there's lots of choices out there for nice waffle irons. I must make sourdough waffles! I've been making and enjoying sourdough pancakes, but I have yet to make sourdough waffles. This oversight must be corrected! Both Sylvia's and MD's look soooo yummy. My mother found it, literally, on the junk heap of a used furniture store about 45 years ago. My wife and I took possession of it about 30 years ago. I think it was manufactured in the 1920's or 1930's for coffee shop use. When we got it, it was thickly encrusted with seriously rancid grease. I'm sure the grease is what kept the cast iron parts from rusting. But it really was fragrant, especially in warm weather. We had it steam cleaned by a fellow who serviced restaurant kitchens, re-seasoned the irons and have used it ever since. Now, this is a pretty fancy appliance. It's actually electric. It has 3 settings: Off, On and keep warm. You know the waffles are done when ... well, when they look done. (This is generally just before they stop steaming.) It makes the best waffles I have ever had, but I bet the sourdough ones I'm going to make this weekend will raise the bar. Here's how I make mine. It's a fantastic way to use leftover starter. I generally double this recipe. In fact, come to think of it, I put the doubled recipe in the handbook here. David! This is the Best yet! I love it....puts my old plate to shame! "lol"...I lit up when I saw your photo...can't wait to see some waffles! You made my day! That is one awesome piece of equipment, David. Stuck with it? No way! Your mom was one savvy lady to snap it up and you wisely saw the gem under the grease. You just can't beat the classics.. The only problem is where to store them. I had an old meat slicer, just like you would find in the deli. What a treat to use for making deli roast beef etc. The only problem is that it weighed a ton and took up lot's of storage space. This waffle iron has a reserved place of honor on the floor of our walk-in pantry. I always remind myself to bend my knees while lifting it. It must weigh around 20 lbs. Fortunately, it is uniquely large among my non-stationary kitchen toys. David - impressive contraption for waffles! You can get a good production output with that baby. I remember seeing very similar if not the same in a few hotel resturant kitchens. Highlight with your cursor and mouse the test you want to serve as a hyperlink. Press the chain button at the top of the editing box. Paste the link address into the appropriate box. That's it! If you don't want the link anymore, highlight the linked text and press the broken chain button. I will make a note! I'm still looking for a SD recipe with buttermilk that will knock my socks off. Your version sounds like it may. I've tried using dried buttermilk, but that just doesn't do the trick. LindyB - the recipe Betty lists is the exact one I use from the KA Baker's Companion. Whe I first tried it a few years ago, I had to stay completely off dairy for awhile due to allergy tests, so I used soy substutes, which were good but not great. Since then, I can have dairy now in limited amounts, so when I make these now for the family, I only use butter and buttermilk as directed (although I do use the baker's buttermilk powder and it works great). The buttermilk or buttermilk powder makes a big difference in how light and flavorful this comes out, the acid in the buttermilk reacts with the baking soda when you add it last minute and causes a huge amount of gas bubbling and rise (make sure you have a big enough bowl for the rise). 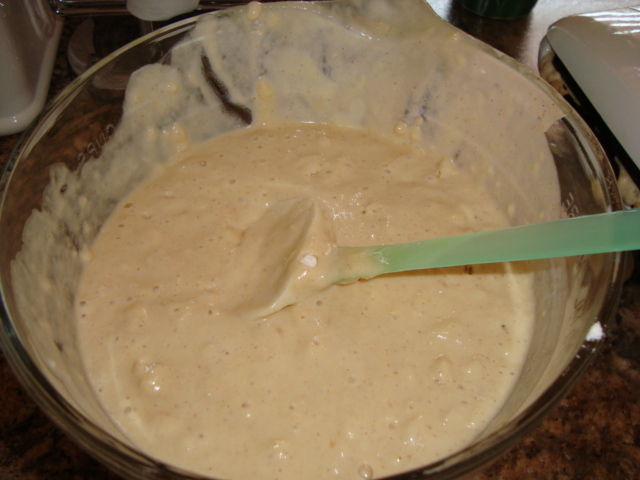 I wait until the iron is heated up and I am ready to pour the batter before adding the baking soda to the rest of the batter, so that it is still full of gas bubbles when it cooks. Thanks for tip when to add the baking soda, MD. I picked up a quart of buttermilk today, refreshed my starter when I got home, and plan to mix the sponge in about 15 minutes. The wind is blasting snow against the windows and the temps are supposed to get to subzero tonight. Again. Am going to need some comfort food in the morning! Can I make and freeze the waffles? I too made waffles from my starter discards this weekend and never again will I buy those expensive mixes from Williams & Sonoma! They were so good I made them 2 days in a row, Saturday with freshly-made raspberry sauce, and Sunday with blueberry sauce (ran out of Aunt Jemima), both days topped with whipped cream. I was swimming in endorphin! I am driving to Chicago this weekend and was planning to bring my stash of starter and the Belgian waffler for brunch for a bunch of people. It would be simpler if I can make the waffles here (they take a while to cook and you can't make them en masse like pancakes). Has anyone tried freezing them? How do I ensure they come out as great as the day they were made? Sourdough waffles freeze very well, indeed. I just throw mine in a big ziplock bag. When I want a waffles, I put it in the toaster directly from the freezer. Very tasty. My husband has been eating his frozen toasted waffles and they are delicious...one thing I might suggest is if they are to be frozen..bake them in the waffle iron only till just cooked with no extra browning! Save that for the toaster! 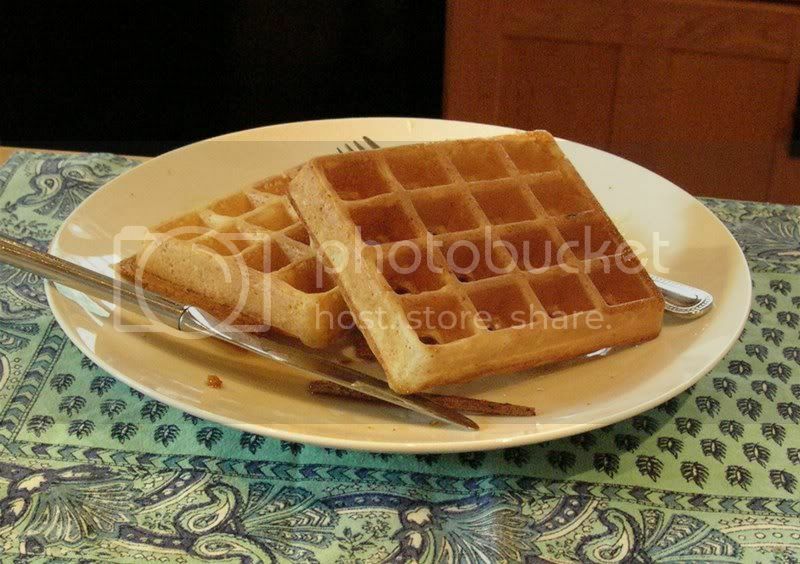 Place frozen waffle in the toaster for a delicious and crispy waffle! I've never tried freezing them..
because there is never any left over. 2 years ago we had our regional department meeting (about 35 peeps) with a pot luck breakfast. I mixed up batter for 20 waffles and toted my waffle iron to work. I should have made double that. 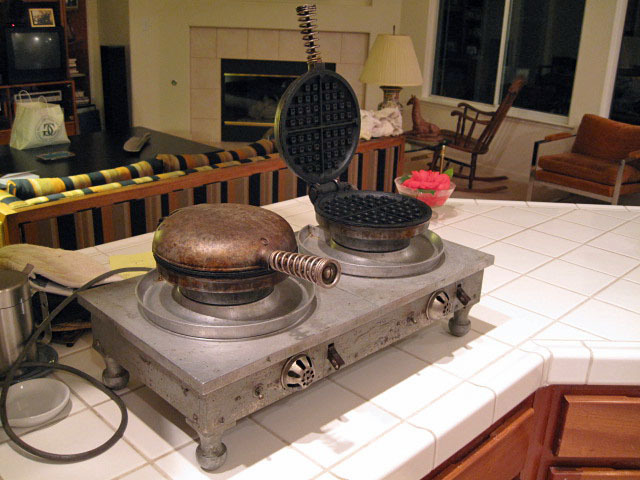 I received quite a few requests for starter and questions on where to get the waffle iron. The next year there were 2 of us manning our waffle irons. Now there are 3 of us and the pot luck has turned into a waffle extravaganza with more toppings than you can imagine. Lots of fun. I'm sure they are very good frozen, but I know positively that made fresh they will knock everyone's socks off. It does take a bit of time to cook them, but once the iron is hot it goes very quickly. Thanks for all the good tips on freezing waffles, and Betty, that is such a great idea for like a breakfast buffet for a small corporate function. And then folks can just dress up the waffles as they please! Love it! Crisp, feathery light, and with a delightful, mild tang, these waffles evoke memories of Goldrush days in California, when sourdough pancakes, biscuits, and bread were served to miners morning, noon, and night. Read our blog about these waffles, with additional photos, at Bakers' Banter. 1) To make the overnight sponge, stir down your refrigerated starter, and remove 1 cup. 2) In a large mixing bowl, stir together the 1 cup starter, flour, sugar, and buttermilk. 3) Cover and let rest at room temperature overnight. 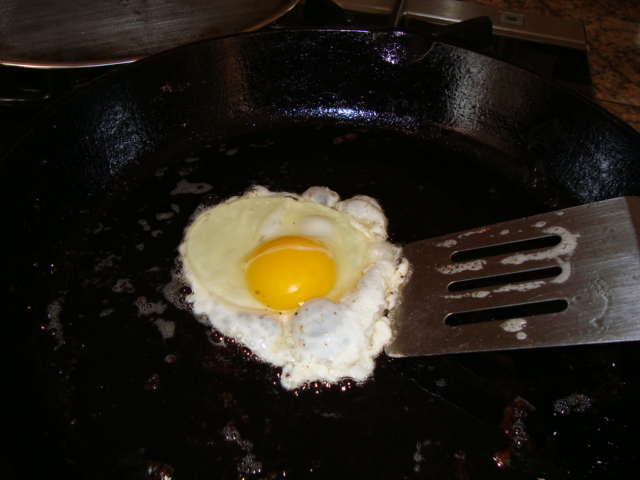 4) In a small bowl or mixing cup, beat together the eggs, and oil or butter. Add to the overnight sponge. 5) Add the salt and baking soda, stirring to combine. The batter will bubble. 6) Pour batter onto your preheated, greased waffle iron, and bake according to the manufacturer's instructions. 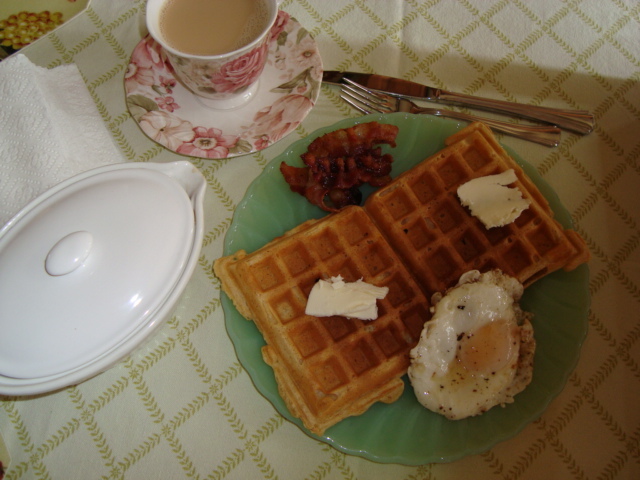 7) Serve waffles immediately, to ensure crispness. Or hold in a warm oven till ready to serve. Thanks for posting by weight, David. Since I don't have a waffle iron (yet), I used the mix for pancakes for Saturday brunch, following the volume instructions. They were quite hearty and filling, but I was suprised that I barely tasted the buttermilk. Still tasty, though. Am sure my heavy hand was the culprit. I also refrigerated the sponge overnight, which I won't do next time just in case that had an effect. I don't know if it makes a difference or not, but I leave my sponge on the counter overnight.. Thanks David..thought I'd make this recipe today using some of Trader Joe's frozen wild blueberries! They are very small blueberries and fit nicely into the waffles...but I've made waffles with the fresh large blueberries and they are much tastier! Okay. I'll try again this weekend and try to mix the batter with a lighter hand. 1/2 Tbs sugar, honey, agave syrup, etc. Add egg mixture to flour mixture, stir well. Bake waffles. From my Belgian-type waffle iron, this makes three rounds, 6 waffle squares. Serve with maple syrup and fresh fruit. Maybe some bacon. Even though all whole grain, these waffles are light and delicious!! Dave, sourdough waffle's sound delicious...everyone seems to love them and it's been awhile!